Spinning through space, a ship crewed by clones suddenly springs to life with one of several simple missions. In Undercrewed, up to four players construct and crew a spacecraft with simple, but dangerous, missions to undertake. 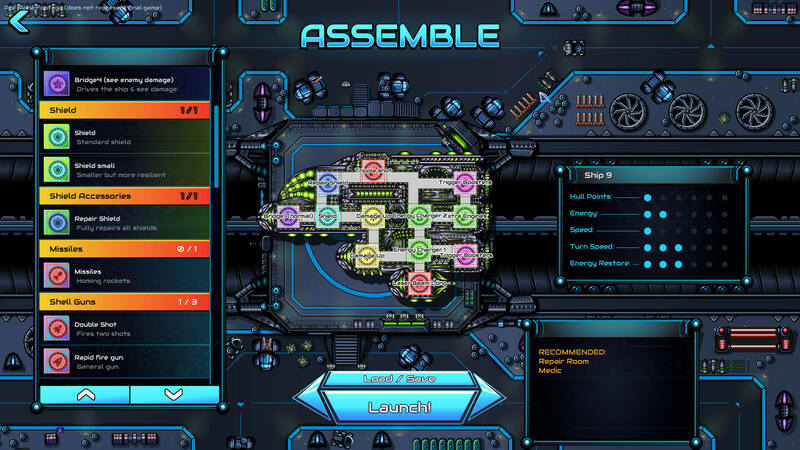 Undercrewed, from Dave and Dex, is an extremely fun multiplayer game where players can customise a ship (from an enormous selection of parts) before setting out on a variety of deadly missions. 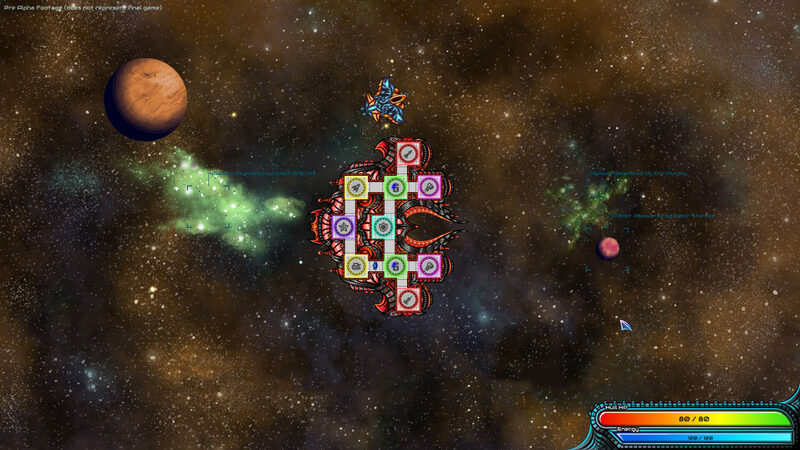 While space shooters are certainly not new, and the local multiplayer genre is filling up well recently, Undercrewed has got several major edges over the rest. For a start, there’s an online multiplayer system tied to the Steam Lobby, so that very quickly gives it an edge over plenty of the other cooperative games heading to launch at the moment. At the other extreme, there’s a very competent AI available to top-up your crew if you decide to play solo or can’t quite muster four players. While at the London Play Expo I watched a team of AIs maintain their ship while under heavy fire and eventually overcome their objective: a giant enemy ship. Outside of the above, there are two things I feel are critical to why Undercrew is a game to watch: its customisation and visual style. Undercrewed’s customisation is vast. We only got to tinker around with a single ship layout, and only saw around a dozen of the components that will be available when the game hits Early Access. There are, from a quick glance at the skill tree, around one hundred ‘rooms’ to unlock. These vary from defensive bots (for fighting off boarding enemies) through to holo-doctors and a massive selection of deadly weaponry. The visual style, then, is fantastic. I’m going to do something I try to avoid doing when writing about games and drum up some other games for comparisons. The ship layouts hearken back to FTL’s functional ship layouts, while also reminding me of some of the procedural ships in one of my current favourites, Heat Signature. While Undercrewed, especially during combat, is extremely fast-paced, the themed room types are especially easy to parse… should you have not paid too much attention while building up the ship before the mission. Naturally, as with all games designed for tight teamwork, it is quite easy to get muddled, but that’s something I really doubt anybody is going to solve any time soon. For now though, the visual style is an excellent way for players to quickly refocus as the objectives shift. As each of the player characters are clones, there’s no difference between them regarding abilities. This is a great choice, as it lets players move between roles as required without a need to specialise. While communication is key, I find it unlikely that people will slot into leadership roles, what with the pace of the mission the team and I played at the event. The developers have plenty of ideas for their time in Early Access. Undercrewed’s programmer David Strachan was at the event and talked us through some of the features we didn’t get to see, including objectives like solving gas leaks and putting out fires. It would be interesting to see a selection of more brutal objectives in later builds — things like asteroids which must be shot before colliding with the ship, with failure resulting in anybody in that part of the ship being sucked out and forced to regenerate. Either way, there is already enough planned that the game will be worth keeping an eye out for. Undercrewed is set to launch into Steam Early Access later this year.